Home Religious Complete Puri tour in 48 hours! 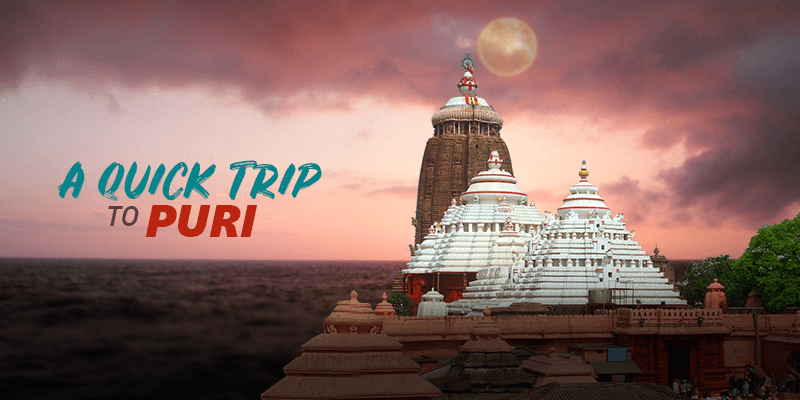 Complete Puri tour in 48 hours! Puri is the favorite quick weekend destination in Eastern India and during the Rath Yatra this place becomes the focal point for religious tourism in India. With just a week to go before the tourists pour into this holy city to participate in Puri Rath Yatra 2018, we thought of keeping you informed about tourist places in Puri you can visit to maximize your tour potential. Puri tourism allows you to explore those age old temples, azure coastlines and shop to your heart’s content. Assuming that you are planning a couple of day’s quick trip to Puri (in Orissa), here are some great places to visit in Puri within that limited time-frame. Coming up, is your cheat code to plan a 48 hours trip to the Land of Lord Jagannath! It is quite evident that your first destination during the Puri trip would be the Puri Jagannath Temple. 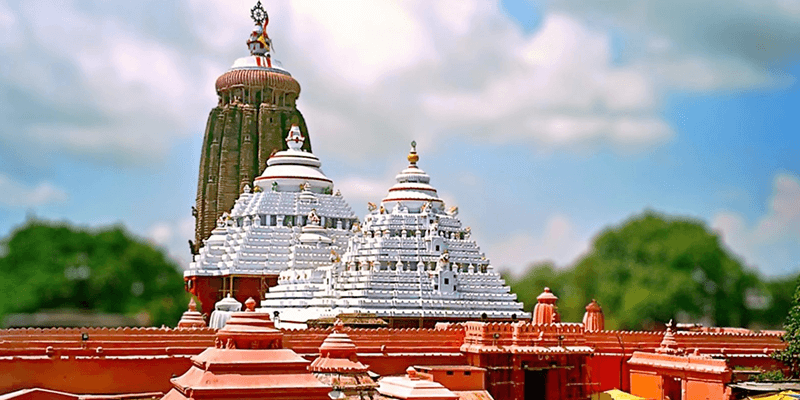 While the temple remains flooded with devotees during the Rath Yatra, it is not necessarily one of the tourist places in Puri meant solely for the religious minded travelers. The temple gives a fascinating insight into India’s ancient temple architecture. Built back in the 11th century by the king of Kalinga, Chodaganga, this is the most revered Lord Jagannath temple in the world. This huge temple is decorated with intricate carvings throughout and has a mammoth 20 feet wall. There are more than 120 smaller shrines inside the temple’s complex. Puri Jagannath temple has one of the largest kitchens in the world and this space is needed to cook 56 different dishes (as a part of the Mahaprashad) every day! The dishes are not only cooked for the Lord, this Prashad can be booked by thousands of devotees. While millions of devotees would be visiting the Puri Jagannath temple during Rath Yatra 2018 festivities, even on an average day the temple is thronged by more than 2000 devotees! Tip: The Prashad offered to Lord Jagannath can be booked from the Temple Trust’s office in the early hours of the morning. The earlier you visit, the better it would be! Once you have sought the divine blessings it is time to immerse yourself in other worldly joys. Well, the shopping area near the Jagannath Temple is like a dreamland for the shopaholics. The row of shops will enthrall you with their variety of items – from sarees to suits, bags to shoes, you will get everything! 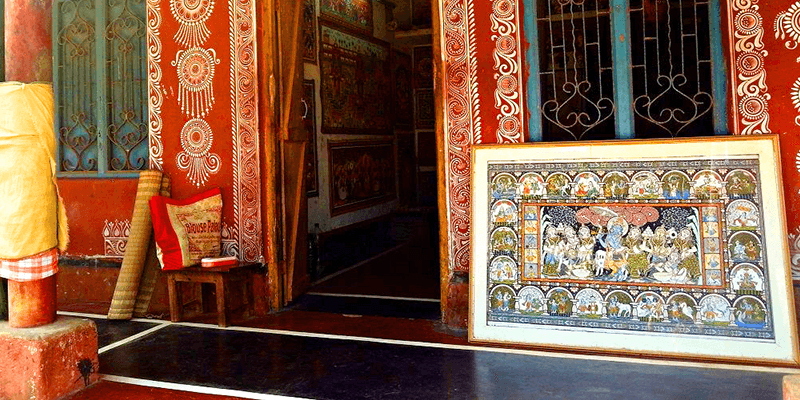 These shops have an extensive collection of Orissa’s traditional crafts and handloom. 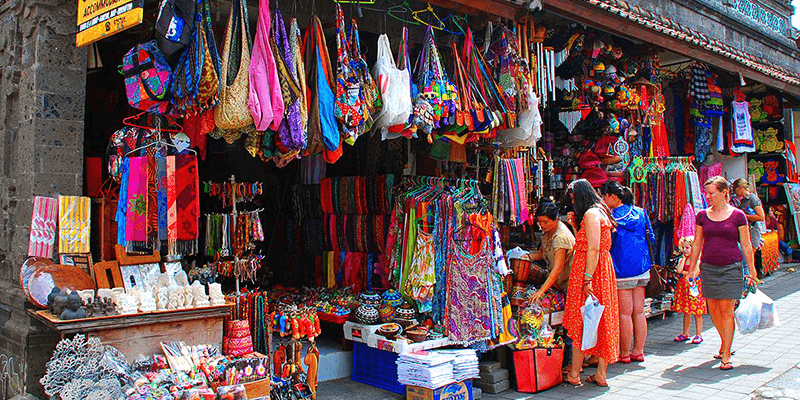 The shops carry an extensive collection of Orissa’s traditional prints such as Ikat, Bomkai and Passapali. You can also look through the collection of Orissa’s famous handicraft items such as Patta Chitra. Once you have shopped to your heart’s content it is time to visit Puri’s famous sweet shops and when you are there do care to taste their ‘Khaja’! This is an exclusive Puri sweet. Tip: The prices of items are surged significantly for the tourists during Rath Yatra season. So, start honing your bargaining skills! Must taste: If you want to taste the best Khaja sweet in town, then head to Kakatua outlet. You can also pack some sweets for your friends and relatives back home. Known for its gigantic waves, Puri beach is one of the most appealing reasons for tourists to head to this ever bustling town. Right after you have shopped to your heart’s fill, you can head to the beach for a bath. As mentioned before, Puri beach is characterized by gigantic waves and a slope at the beach (which can get quite steep. The beach is a lively place to be at, where you can either take a bath in the waters or relax at the shores watching different people doing myriad things. 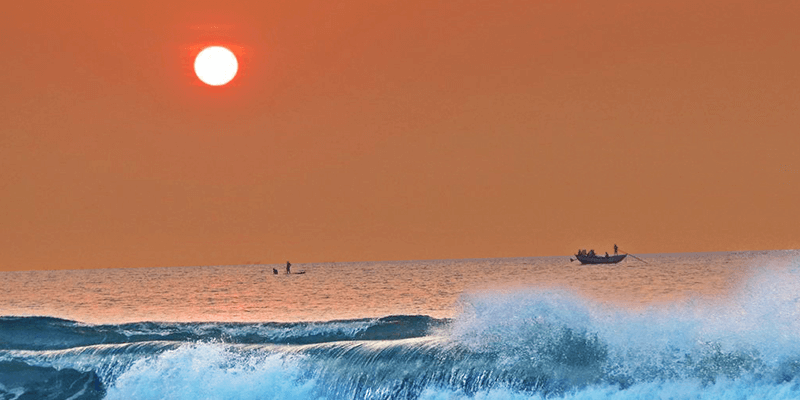 Puri beach is also the best destination to end your first day’s sightseeing, with a mesmerizing sunset view. Trivia: During the months of November-December, Puri Beach Festival is organized. The festival features brilliant sand arts by the famous artist, Padma Shri Sudarshan Pattnaik. Tip: As mentioned there is a steep slope at the Puri beach, so be careful while you take a bath. 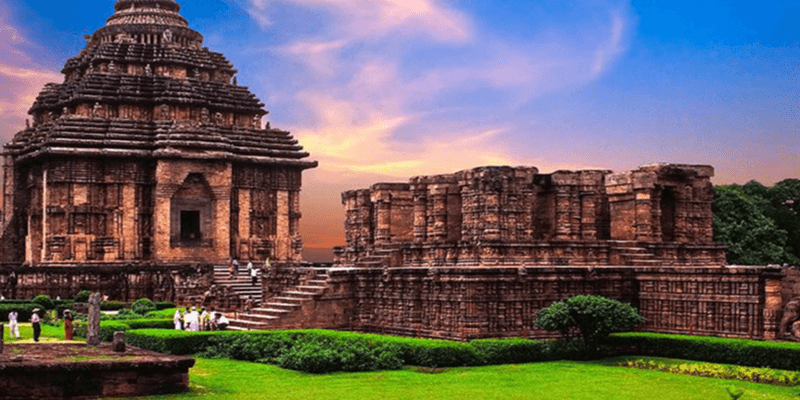 Konark Sun Temple, located 35 KM away from Puri, is a not-to-miss attraction near Puri. This 13th century temple is known for its unique shape. The temple’s architecture resembles the chariot ridden by the Sun god. The chariot is driven by seven horses and has twelve intricately carved wheels on its sides. The walls of this temple are beautified with carvings depicting scenes from Hindu mythology, plants, flowers, animals, etc. Each year during February, the temple witnesses a cultural extravaganza when the Konark Dance Festival is organized at the temple premises. Tip: Leave for Konark early in the morning to experience the rays of the sun falling directly on this beautiful structure. Drive for another 40 KM (from Konark) and you will reach the heritage crafts village of Raghurajpur. Along the route you will come across groves of coconut, palm, mango and jack fruit apart from a view of rural Orissa. Once you reach the village, you would be welcomed by 100 homes of artisans. The houses might be small but they are beautifully decorated with mural paintings. All the ancient arts and crafts of Orissa, including the 900 year old Patachitra, are practiced in this village. You can watch the artisans at work, talk to them and learn a few tricks from them. Patachitra is the real show stealer among the crafts items on display at Raghurajpur Crafts Village. This ancient craft form depicts mythological stories which are drawn so precisely that they are no less than visual depictions! Tip: These artisans have been preserving the local art since ages and it’s only wise to support them by buying a few pieces of their work from the village. 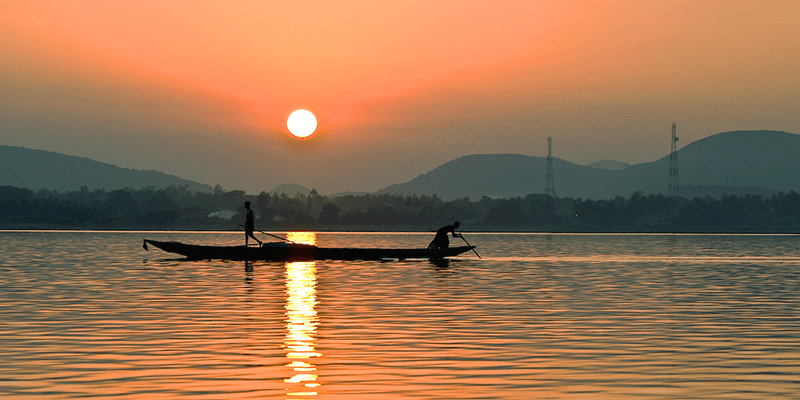 Chilka Lake, one of the largest brackish water lagoons in the world, is a famous Orissa tourism destination. And the sunset cruise on the Chilka Lake is the perfect way to pull curtains on your 2 day trip to Puri. Cruises on the lake are available from the jetty at Satpada village. The waters turn into numerous shades of red during the sunset hours and it’s not just a delight to the eyes but also to the mind. If you are lucky, you might even spot some Dolphins during your cruise! Boats take you to the Rajhans Island, where you can spot a lagoon on one side and the Bay of Bengal on the other. It’s a sight to behold and you must not miss out on this experience. Tip: Chilka Lake is quite famous for its pearls. So, if you can identify the true pearls then go ahead and purchase some pearls here. So, are you ready to make your two day trip to Puri a visual and sensual treat? Next article5 Scenic bus routes of Gujarat, you never knew about! How to confirm my ticket for puri..?